Appearing on Jeopardy! is something I’ve wanted to do my whole life, so getting to actually experience it was surreal in many ways. In March 2014, some friends and I went to a taping of the Big Show and it was great to see it all in action. That is actually where I first learned Sports Jeopardy! was in the works. I won’t go into the full audition process here, but I will say that I left the in-person audition feeling that although there were definitely people better than me, I could be competitive, and with the right categories and a few lucky breaks I would have a shot. In essence, that’s what happened. Not the part about the categories. They were not the right ones for me at all! But overall I felt like I was competitive along the way and got those few lucky breaks. When the show starts, it’s overwhelming how fast it all moves. You really just want to get into the game somehow and get on the board. I probably got jumpy early on and buzzed in on some questions I shouldn’t have. Everyone always talks about the buzzer timing and how tricky it is to figure out. I was also trying to be really quick on the buzzer, but again that got me in some trouble. I also had to remember that when I shout out wrong answers on the couch at home, nothing happens. On the show, you lose points. Getting into the hole early was not so fun. I started thinking that I’ll be embarrassed on the show and never find a way out. Yes, I’ve seen a lot of episodes where people come back and tried to tell myself there’s plenty of time and anything can happen. Being in the negative made me little more hesitant on some questions. I probably knew the answers to a few of them (wrestling, bull), but didn’t want to risk going more negative. Ok, “Quoting the Bible.” Obviously, I was excited to see that as a category, but still wasn’t exactly sure what to expect. This wasn’t like bible categories on regular Jeopardy!, so there was still a lot to worry about. Finding the Daily Double there was great, but still a little tricky. On one hand I wanted to wager the max, 1,000, to try to get out of the hole. On the other hand, I didn’t want to risk getting further down. I decided to go for it with 1,000 and this clue came up. Obviously, the New Testament isn’t my specialty. But thankfully I have watched enough sporting events and seen fans with signs saying John 3:16. When I was young, I remember being curious about that verse and went to look it up. I guess it always stuck with me. 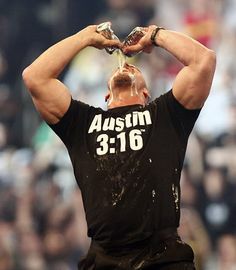 I was a little worried about confusing it with Job 3:14, thanks to Mission Impossible, or Austin 3:16, because Stone Cold said so. The last question of the round in the dreaded Rodeo category, was one of those ones that I didn’t really know, but there wasn’t anything else it could be. Part of what makes Jeopardy! a great show is the writing. They don’t just ask a random question, they ask it in a good way that gives you some information. Figuring out it was talking about spurs was huge because it got me into the positive to start Double Jeopardy. Double Jeopardy moved quickly. I liked the Time Magazine category, partially because I had read that issue a few weeks before the taping. I knew I was weak on basketball, so seeing a Hoopsters category had me worried. Everything else was so random that I didn’t know what to expect. Final Jeopardy. One thing I did study in preparing for the show was the wagering strategy. A friend of mine, Michael L., turned me on to a website “The Final Wager” that has a whole tutorial for how to wager smartly. I studied and practiced this multiple times in the weeks leading up to the taping. It’s all arithmetic, but it still can get confusing to make sure you’re calculating correctly. Especially in the moment itself. The short version of the strategy is this: Jose assumes I’m going to double up to 8,500. He wagers enough to beat me – 751. If he does that, and we both get it right, I lose. So the strategy says to assume the leader gets it wrong. If Jose wagers 751 and gets it wrong, he will be at 6,999. I wagered just enough to top that – 2,751. I probably didn’t need to throw the 1 in there, but I did just to be safe. Again, it’s just subtraction to figure out the 2,751, but I wasn’t 100% sure I had done it correctly. After a few seconds of being angry that this was stupid question I started to break it down. The category was “Ball Sports” so things like rowing are out. (Funny side note, before the post-game interview, Dan Patrick said he would have gone with rowing, forgetting about the category.) Considering the time frame, the only sports I thought could possibly be the answer were cricket and polo. But cricket has never been popular in the U.S., so ending British dominance in it didn’t make sense. The clue made sure to mention Yale which got me thinking about New Haven. Yes it’s stereotyping, but doesn’t something about polo and horses just seem so New Haven? I went with that, thinking the answer made sense, but not being particularly confident in it. Dan’s comment before getting to the answers was great. Yes, this was a tough question. He wasn’t sure anyone was going to get it. It came time to reveal the answers and Jen goes first. Racquetball – incorrect. She risked everything and lost it all. At this point I knew I was guaranteed at least second place. Nothing wrong with $2,000. Dan came to me and I said, “What is Polo?” In full Dan Patrick fashion, he pauses dramatically before saying “that’s correct.” I’m pretty happy. There was a great reaction in the crowd when I revealed the wager and moved up to 7,001. I think people were a little surprised I didn’t risk it all and move into the lead right away. But this was much more dramatic! Jose showed his answer of lacrosse, which I knew wasn’t correct, both because it began as a Native American sport and because we had just learned polo was the answer. At this point, really the only way I would lose was if he wagered 0. Thankfully, he did just what he was supposed to do and risked 751. Even when he revealed that wager I wasn’t sure I had won. I still could have done the math wrong, or messed up somewhere along the way. It wasn’t until the numbers changed on the board that it all sunk in. To say I was pretty happy about it would be an understatement. If I had just passed the online test, but not been able to get to the in-person audition – Dayeinu. It would have been enough. If I had gone to the in-person audition but not gotten to appear the show – Dayeinu. If I had appeared on the show but not won my episode – Dayeinu. If I had won my episode but not in as dramatic a fashion – Dayeinu. If I had won my episode in dramatic fashion, coming from behind on Final Jeopardy to win by two points… No. That’s it. That was pretty awesome. In all seriousness, this whole experience was amazing. Definitely something I’ll remember for the rest of my life. I can’t wait for the moment when I’m watching NBC Sports Network in the middle of the night and my episode happens to come on. I’ll be sure to give everyone a call and wake you up so you can watch too! Thank you everyone for watching, commenting, and all your support along the way! Loved the blog. Can’t wait to see the episode. Will you be in the tournament of champions? great video. Great blog. yasher koach and gratulationes!